First of all, I have to point out that I found it hilarious that we found out about TU’s new uniforms via the coach tweeting out phone-taken pictures of them displayed on a table… but hey they are pretty awesome so I won’t complain too much! 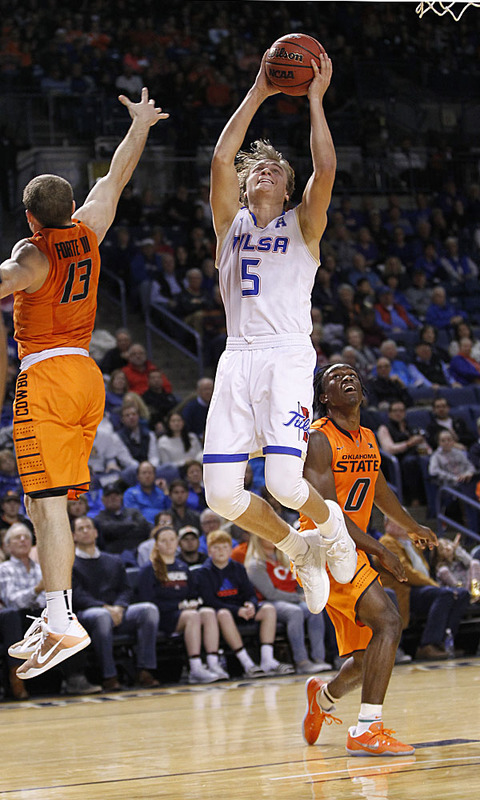 I never really wrote too much about Tulsa’s basketball uniforms last year because well, there wasn’t too much to talk about. I didn’t hate them, they just didn’t do anything for me. All three of these uniforms are better than the 2016-17 version. From the striping, to the script, these uniforms are (mostly) a hit for me all the way around. The biggest upgrade made to the uniforms is the change to script Tulsa from the block lettering. I was slightly skeptical about how script would look on the basketball uniforms due to the way these blended into the jersey, but the way the double-color outline sets the script off from the uniform is beautiful. The slightly smaller size is just about right too. While I am on the topic of double-color outlines, I love the way these numbers look. I think this is the same font as last year, but it just looks sharp on these uniforms. Adidas should definitely double-down on the stripes by adding them to the football uniforms, but I also think football should try to copy the design of the new black basketball jersey. Last year’s black football uniforms were quite disappointing as the white logo and numbering made them look like high school uniforms, or worse… Kansas. The blue script outlined in gold makes these new black basketball uniforms look mean, classy, and unique. I knew that last year’s design was just a start, but I was surprised that Adidas granted us with new uniforms less than a year later. The new design answers all of the complaints that the previous uniforms had. Complained about not enough gold? All three uniforms have gold striping. Complained about no script? There’s the script. Complained about no striping? BOOM awesome stripes. Complained about not unique for TU? Inside the collar has “Est. 1894” or “Tulsa Rising”. I was one of the biggest skeptics of Adidas, but the job they’ve done with Tulsa has been good, and is verging on great. Here’s to hoping for new football uniforms too.